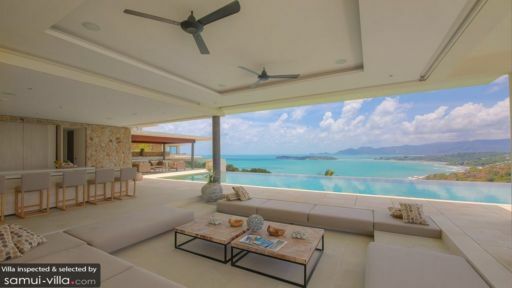 Hugging close to the coastline of Choeng Mon, Villa Yee Sip Bpaet sits within the exclusive villa estate of Samujana. Step into the estate compound, and you will find a fine selection of modern and stylish vacation abodes in a peaceful environment. The villas overlook the sweeping bay, offering guests with spectacular vistas of the sparkling sea. A total of three capacious master bedrooms are contained in the luxurious villa. Similar to the other living spaces, the master bedrooms features furnishings and fixtures in soothing hues of cream. Draw back the velvety drapes, step out onto your private balcony, and you will set sight on stunning sea views and Choeng Mon’s picturesque coastline. Three well-appointed double bedrooms provides ample space for accommodating large groups of travellers. The neutral colour scheme offers a pleasing sight, while the eye-catching paintings add a vibrant splash of colour to the rooms. Rise up bright and early in the mornings, and relax in your private balcony while enjoying mesmerising views of the sea. Step into the spacious compounds of Villa Yee Sip Bpaet, and you will find a well-manicured garden, sparkling infinity pool and expansive pool deck. 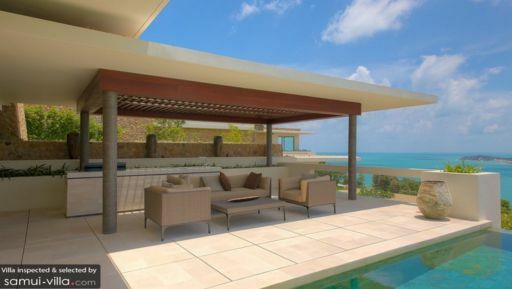 Spend your days lounging outdoors upon one of the comfortable sun loungers. When the heat of the tropics feels overwhelming, cool down by taking a dip in the pool, or retreat into the shady interiors of the villa. Guests will find an array of chic and modern living spaces. Bedecked in neutral shades and simple furnishings, the soothing interiors are enlivened with a tasteful selection of unique art works and ornaments. The open plan design of the living area allows plenty of sea breeze and sunlight to stream in, while guests tucking into a meal in the dining area can enjoy sweeping views of the coastline while they dine. Villa Yee Sip Bpaet is a full service property with two on-site staff. Housekeeping services, personal guest services, security services, welcome drinks, airport transfers and a daily breakfast service are included with your stay. 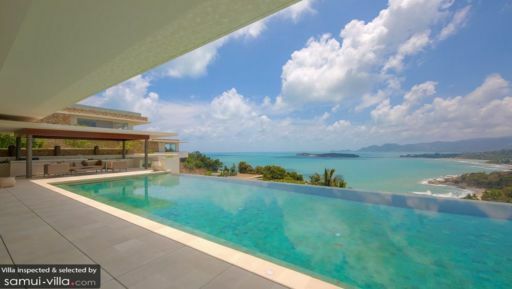 Villa Yee Sip Bpaet is the perfect vacation rental for the active and adventurous. Holidaymakers with a love for getting wet and wild may embark on a water ski, diving or snorkeling trip. Nature lovers and cultural buffs will enjoy venturing out to explore tumbling waterfalls, ancient temples and lush nature parks. Sailing and yachting enthusiasts can take their pick from a fleet of sailing boats or motorboats, and spend a day out in the sun cruising through the turquoise waters. At the end of a fun-filled day, spoil yourself with a soothing massage in the compounds of your villa. I consider myself fortunate to have been able to spend my recent birthday at Samujana with a group of friends. The villa we had was extremely spacious, 6 bedrooms, large pool, outdoor entertaining area where we pretty much spent most of our time. Icing on the cake was the indoor movie theatre, and fully fitted out gym, which with the weather being so great we didnt make much use of... Our villa manager Khun Joy was amazing and went above and beyond. Nothing was too much trouble. I have lived and worked in Asia for a number of years and been fortunate to have stayed in Aman, Four Seasons, Ritz Carlton and whilst always receiving a high level of customer service associated with these brands sometime "out of the box" thinking unfortunately doesn't happen. On arrival to the villa we were given a mobile phone with our Villa Managers number saved into the contacts and was told to call if ever we needed something. On the night we left the resort to enjoy dinner at a near by restaurant we mistakenly left the mobile back at the villa. We changed venues a couple of times during the evening, and we're taken by surprise when Khun Joy after not hearing from us, contacted the driver to find out where he had dropped us of last, and then called the restaurant to find out if all was OK. I would recommend Samujana to anyone that wants a resort atmosphere but also wants their own space. I am already looking at the diary to see when i can return! Stayed at Villa 28 for two weeks at the end of March. Words struggle do justice to how fabulous this villa is. The view over the sea, islands and surrounding countryside are superb, incredible to take in while enjoying your hearty breakfast or sampling the delights created by the in house chef who's culinary talents can be enjoyed for lunch or dinner. The layout of villa 28 was just perfect for us. Stunning, expansive seating and main living area overlooking the large infinity pool, two master suites on the upper floor with four further large double bedrooms on the lower floor, shared with the cinema, study and air conditioned and well equipped gym. The villa manager and maid were very friendly, courteous and professional, everything was provided as required and they were quick to learn how the guests liked things done, making the stay even more enjoyable. We all had a truly fabulous time here, I cannot recommend a stay highly enough. An outstanding location with views that have to be seen to be believed! A living area with truly stunning panoramic landscapes and seascapes. Perched high above the blue seas of the Gulf of Thailand. Swimming in the large L shaped pool, leaning on the edge admiring the bird life, beach and fisherman boats was pure pleasure. A truly magnificent location. Large dining area with sun beds aplenty and loungers. The BBQ area was very usable and in the evening fresh fish and prawns cooked by ourselves or the villa staff was a delight as was watching the sunset (stunning and never the same) The bedrooms have excellent facilities and views. The cinema room is perfect but I confess the outdoor life and the Samui climate precluded me from going there very often. The gym is well equipped and popular with most of the family. A walk down to the beach is a joy the return trip a challenge but so rewarding. The staff were faultless and added to our Thai experience nothing was too much trouble. Close enough to the "Tourist" parts of the island but remote as remote could be when in the confines of the villa. If you enjoy luxury and Thailand then look no further.